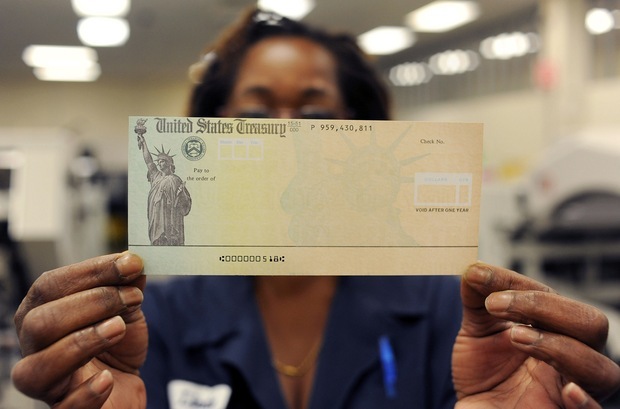 Treasury employee Linda Tarkenton of Philadelphia holds a blank U.S. Treasury check before it’s run through a printer at the U.S. Treasury printing facility. Photo by William Thomas Cain/Getty Images. 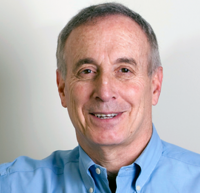 Update: | Laurence Kotlikoff has agreed to answer your questions about Social Security and retirement. Read his first set of responses here and submit your queries here. Be forewarned that Larry is sometimes wrong but rarely in doubt, and all of his answers to your Social Security questions are reviewed for accuracy by a former Social Security Administration technical expert. Know, too, that he has worked for many years to fine-tune retirement software — ESPlanner — that is widely considered the gold standard in the online world. We’ve long linked to the basic free version of ESPlanner from this page. Know also that Larry is my own personal Social Security adviser. His advice to apply for a dependent spousal benefit while my wife and I put off full retirement benefits until age 70 has been a boon, and so impressed the woman with whom I spoke at Social Security, that she thanked me for informing her of it and said she’d advise callers about this option henceforth. Note that many of Larry’s “secrets” involve the dependent spouse benefit. Be advised that the folks at Social Security with whom I’ve dealt have been uniformly courteous, responsive and efficient. Editor’s Note | A version of this post originally ran July 3, 2012, on Forbes.com. The Social Security Handbook has 2,728 separate rules governing its benefits. And it has thousands upon thousands of explanations of those rules in its Program Operating Manual System, called the POMS, which provides guidance on implementing the 2,728 rules. Talk about a user’s nightmare! At that point, I realized I needed to quadruple check my understanding of Social Security’s provisions. To do this, I established contacts with experts at Social Security’s Office of the Actuary. I also hired a specialist whose only job is to audit my company’s Social Security, Medicare premium, and federal and state income tax code. Mind you, a large share of the rules in the Social Security Handbook are indecipherable to mortal men, and the POMS is often worse. But thanks to patience on the part of the actuaries, I’ve learned things that almost no current or prospective Social Security recipient knows, but which almost all should know. The reason is that taking the right Social Security benefits at the right time can make a huge difference to a retiree’s living standard. Unfortunately, Social Security has some very nasty “gottcha” provisions, so if you take the wrong benefits at the wrong time, you can end up getting the wrong, as in smaller, benefits forever. Also, the folks at the local Social Security offices routinely tell people things that aren’t correct, including about what benefits they can and can’t receive and when they can receive them. Taking Social Security benefits — the right ones at the right time — is one of the biggest financial decisions you’ll ever make, so you need to get it right. Getting it right on your own, however, is neigh impossible. One of my engineers and I calculated that for an age-62 couple there are over 100 million combinations of months for each of the two spouses to take retirement benefits, spousal benefits and decided whether or not to file and suspend one’s retirement benefits. There are also start-stop-start strategies to consider. Each combination needs to be considered to figure out what choices will produce the highest benefits when valued in the present (measured in present value). For some couples who are very different in age, survivor benefits also come into play. In that case, the number of combinations can exceed 10 billion! Fortunately, www.maximizemysocialsecurity.com can help you find the right answer generally within a matter of seconds. It does exhaustive searches of all combinations of months in which you can take actions, but thanks to modern computing power and careful programming, our Maximize My Social Security program can run through millions upon millions of combinations of decisions incredibly fast. If you are already collecting your retirement benefit and are at or over full retirement age, you can tell Social Security you want to suspend further benefits and then ask them to restart your benefits at a later date, say age 70. Social Security will then apply its Delayed Retirement Credit to your existing benefit once you start collecting again. Hence, this is a means by which current Social Security recipients who aren’t yet 70 can collect higher benefits, albeit at the cost of giving up their check for a while. But this trade off will, on net, often be very advantageous. For example, if you started collecting at 62 and are now at your full retirement age, i.e., 66, you can suspend benefits until 70 and then start collecting 32 percent higher benefits for the rest of your life. This benefit collection strategy can be called Start Stop Start. We are in the process of rolling out a new update of www.maximizemysocialsecurity.com, which incorporates Start Stop Start. If you aren’t now collecting and wait until 70 to collect your retirement benefit, your retirement benefit starting at 70 can be as much as 76 percent higher than your age-62 retirement benefit, adjusted for inflation. The reason is that your benefit is not reduced due to Social Security’s Early Retirement Reduction; moreover, it’s increased due to Social Security’s Delayed Retirement Credit. For many people, the increase in the retirement benefit can be even higher if they continue to earn money after age 62 thanks to Social Security’s Re-computation of Benefits. But if you are married or divorced, waiting to collect your retirement benefit may be the wrong move. If you are the low-earning spouse, it may be better to take your retirement benefit starting at age 62 and then switch to the spousal benefit you can collect on your current or ex-spouse’s account starting at your full retirement age. But beware of the Gottcha in item 5. If you’re married, you or your spouse, but not both, can receive spousal benefits after reaching full retirement age while deferring taking your retirement benefits and, thereby, letting them grow. This may require having one spouse file for retirement benefits, but suspend their collection. This is called the File and Suspend strategy. Start Stop Start may also make sense for married workers who aren’t already collecting and whose age differences are such they they can’t take advantage of File and Suspend. Take, for example, a 62 year-old high earner, named Sally, with a 66-year old low earner spouse, named Joe. By starting retirement benefits early, Sally permits Joe to start collecting a spousal benefit immediately. The reason is that spouses aren’t eligible to collect spousal benefits unless the worker is either collecting a retirement benefit or has filed for a retirement benefit, but suspended its collection. If Sally starts her retirement benefit at 62, Joe can apply just for his spousal benefit at 66 and then wait until 70 to collect his own retirement benefit, which will be at its highest possible value thanks to Social Security’s Delayed Retirement Credit. As for Sally, she can suspend her retirement benefit at 66, when she reaches full retirement, and then restart it at 70, at which point her benefits will be 32 percent higher than what she was collecting. Even singles workers may opt for Start Stop Start to help with their cash flow problems. If your primary insurance amount (your retirement benefit available if you wait until full retirement) is less than half that of your spouse and you take your own retirement benefit early, but are able to wait until full retirement age to collect your spousal benefit, your total check, for the rest of your life, will be less than one half of your spouse’s primary insurance amount. Nonetheless, this may still be the best strategy. This reflects another Gotcha explained in 8. On its website, Social Security states, “your spouse can receive a benefit equal to one-half of your full retirement benefit amount if they start receiving benefits at their full retirement age.” This is true only if your spouse isn’t collecting his/her own retirement benefit. If your spouse is collecting her own retirement benefit, his/her spousal benefit is calculated differently. Rather than equaling one half of your full retirement benefit, it’s calculated as half of your full retirement benefit less your spouse’s full retirement benefit. This difference is called the excess spousal benefit. The total benefit your spouse will receive is her retirement benefit, inclusive of any reduction, due to taking benefits early, or increment, due to taking benefits late, plus the excess spousal benefit. The excess spousal benefit can’t be negative; i.e., its smallest value is zero. Take Sue and Sam. Suppose they are both 62 and a) Sue opts to take her retirement benefit early and b) Sam opts to file and suspend at full retirement and take his retirement benefit at 70. Between ages 62 and 66 (their full retirement age), Sue collects a reduced retirement benefit, but is not forced to take her spousal benefit (which would be reduced) because Sam isn’t collecting a retirement benefit during the years that Sue is 62 to 66. Now when Sue reaches age 66, she starts to collect an unreduced spousal benefit because Sam has qualified her to do so by filing and suspending for his retirement benefit. OK, but her unreduced spousal benefit is calculated as 1/2 x Sam’s full retirement benefit less Sue’s full retirement benefit. Sue ends up getting a total benefit equal to her own reduced retirement benefit plus her unreduced excess spousal benefit. This total is less than half of Sam’s full retirement benefit. To see this note that the total equals half of Sam’s full retirement benefit plus Sue’s reduced retirement benefit minus Sue’s full retirement benefit. The last two terms add to something negative. Are there are two different formulas for spousal benefits depending on whether the spouse is collecting his/her own retirement benefit? It sure seems that way because when the spouse is collecting a retirement benefit, the excess spousal benefit (potentially reduced for taking spousal benefits early) comes into play. And when the spouse isn’t collecting a retirement benefit, the spousal benefit equals half of the worker’s full retirement benefit. (Note, the spouse has to collect a retirement benefit before full retirement age if she applies for her spousal benefit.) The answer, in fact, is no. There is only one formula. The formula for the spousal benefit is always the excess benefit formula. But here’s what happens to the application of that formula if the spouse is not collecting a retirement benefit. In that case, the spouse’s full retirement benefit (also called the Primary Insurance Amount) is set to zero in calculating the excess spousal benefit. The reason, according to Social Security, is that a worker’s Primary Insurance does not exist (i.e., equals zero) if the worker has not applied for a retirement benefit (and either suspended its collection or started to receive it). In other words, your Primary Insurance Amount is viewed as non-existant until you apply for a retirement benefit. This construct – the primary insurance amount doesn’t exist until it’s triggered by a retirement benefit application — lets Social Security claim to have one formula for spousal benefits. But there are, in effect, two spousal benefit formulas and which one you — the person who will collect a spousal benefit — faces will depend on whether or not you take your retirement benefit early. If you are divorced, both you and your ex can collect spousal benefits (on each others work histories) after full retirement age while still postponing taking your own retirement benefits until, say, age 70, when they are as high as can be. This is an advantage for divorcees. But there’s also a disadvantage. A divorcee who applies for spousal benefits before full retirement age will automatically be forced to apply for retirement benefits even if her/his ex isn’t collecting retirement benefits. There is no advantage to waiting to start collecting spousal benefits after you reach your full retirement age. There is no advantage to waiting to start collecting survivor benefits after you reach your full retirement age. If you started collecting Social Security retirement benefits within the last year and decide it wasn’t the right move, you can repay all the benefits received, including spousal and child benefits, and reapply for potentially higher benefits at a future date. If you wait to collect your retirement benefit after you reach your full retirement age, but before you hit age 70, you have to wait until the next January to see your full delayed retirement credit show up in your monthly check. Millions of Baby Boomers can significantly raise their retirement benefits by continuing to work in their sixties. This may also significantly raise the spousal, child, and mother and father benefits their relatives collect. If you take retirement, spousal, or widow/widower benefits early and lose some or all of them because of Social Security’s earnings test, Social Security will actuarially increase your benefits (under the Adjustment of Reduction Factor) starting at your full retirement age based on the number of months of benefits you forfeited. This is true whether the loss in benefits due to the earnings test reflects benefits based on your own work record or based on your spouse’s work record. Consequently, you should not be too concerned about working too much and losing your benefits if you elected to take them early. When it comes to possibly paying federal income taxes on your Social Security benefits, withdrawals from Roth IRAs aren’t counted, but withdrawals from 401(k), 403(b), regular IRAs, and other tax-deferred accounts are. So there may be a significant advantage in a) withdrawing from your tax-deferred accounts after you retire, but before you start collecting Social Security, b) using up your tax-deferred accounts before you withdraw from your Roth accounts, and c) converting your tax-deferred accounts to Roth IRA holdings after or even before you retire, but before you start collecting Social Security. Social Security’s online benefit calculators either don’t handle or don’t adequately handle spousal, divorcee, child, mother, father, widow or widower benefits, or file and suspend options. The default assumptions used in Social Security’s online retirement benefit calculators is that the economy will experience no economy-wide real wage growth and no inflation going forward. This produces benefit estimates that can, for younger people, be significantly less than what they are most likely to receive. Some widows/widowers may do better taking their survivor benefits starting at 60 and their retirement benefits at or after full retirement. Others may do better taking their retirement benefits starting at 62 and taking their widow/widowers benefits starting at full retirement age. If you’re below full retirement age and are collecting a spousal benefit and your spouse is below full retirement age and is collecting a retirement benefit, your spousal benefit can be reduced if your spouse earns beyond the Earnings Test’s exempt amount. And it can also be reduced if you earn beyond the Earnings Test’s exempt amount. The Windfall Elimination Provision affects how the amount of your retirement or disability benefit is calculated if you receive a pension from work where Social Security taxes were not taken out of your pay, such as a government agency or an employer in another country, and you also worked in other jobs long enough to qualify for a Social Security retirement or disability benefit. A modified formula is used to calculate your benefit amount, resulting in a lower Social Security benefit than you otherwise would receive. Based on the Government Pension Offset provision, if you receive a pension from a federal, state or local government based on work where you did not pay Social Security taxes, your Social Security spouse’s or widow’s or widower’s benefits may be reduced. If you have children, because you started having children late or adopted young children later in life, they can collect child benefits through and including age 17 (or age 19 if they are still in secondary school) if you or your spouse or you ex spouse are collecting retirement benefits. If you have children who are eligible to collect benefits because your spouse or ex spouse is collecting retirement benefits, you can collect mother or father benefits until your child reaches age 16. Your children can receive survivor benefits if your spouse or ex-spouse died and they are under age 18 (or age 19 if they are still in secondary school). You can collect mother or father benefits if you spouse or ex-spouse died and you have children of your spouse or your ex-spouse who are under age 16. There is a maximum family benefit that applies to the total benefits to you, your spouse, and your children that can be received on your earnings record. If you choose to file and suspend in order to enable your spouse to collect a spousal benefit on your earnings record while you delay taking your benefit in order to collect a higher one later, make sure you pay your Medicare Part B premiums out of your own pocket (i.e., you need to send Social Security a check each month). If you don’t, Social Security will pay it for you and treat you as waving (i.e., not suspending) your benefit apart from the premium and, get this, you won’t get the Delayed Retirement Credit applied to your benefit. In other words, if you don’t pay the Part B premiums directly, your benefit when you ask for it in the future will be NO LARGER than when you suspended its receipt. This is a really nasty Gotcha, which I just learned, by accident, from one of Social Security’s top actuaries. If you are collecting a disability benefit and your spouse tries to collect just his/her Social Security benefit early, she will be deemed to be filing for her spousal benefits as well. I.e., if your spouse takes his/her retirement benefit early, he/she won’t be able to delay taking a spousal benefit early, which means both her retirement and spousal benefits will be permanently reduced thanks to the early retirement benefit and early spousal benefit reduction factors. When inflation is low, like it is now, there is a disadvantage to delaying until, say 70, collecting one’s retirement benefit. The disadvantage arises with respect to Medicare Part B premiums. If you collecting benefits (actually were collecting them last year), the increase in the Medicare premium this year will be limited to the increase in your Social Security check. This is referred to as being “held harmless.” Hence, when inflation is low, the increase in your check due to the cost of living adjustment will be small, meaning the increase in your Medicare Part B premium will be limited. But, if you aren’t collecting a benefit because you are waiting to collect a higher benefit later, tough noogies. You’re Medicare Part B premium increase won’t be limited. And that increase will be locked into every future year’s Medicare Part B premium that you have to pay. You can wait to join Medicare until, say, age 70, but if you aren’t working for a large employer, the premiums you’ll pay starting at 70 will be higher and stay higher forever. So much for helping the government limit its Medicare spending! Hold harmless — the provision that your increase in Medicare Part B premium cannot exceed the increase in your Social Security check due to Social Security’s Cost of Living Adjustment — does not apply if you have high income and are paying income-related Medicare Part B premiums. The thresholds beyond which first 50 percent and then 85 percent of your Social Security benefits are subject to federal income taxation are explicitly NOT indexed for inflation. Hence, eventually all Social Security recipients will be tax on 85 percent of their Social Security benefits. If you take your retirement benefit early and your spouse takes his/her retirement benefit any time that is a month or more after you take your retirement benefit, you will NOT be deemed, at that point (when your spouse starts collecting his/her retirement benefit) to be applying for a spousal benefit. In other words, you can, in this situation, wait until your full retirement age to start collecting your unreduced excess spousal benefit. The retirement benefit collection status of your spouse in the month you file for early retirement benefits determines whether you are deemed to be also be applying for spousal benefits. This means that you should think twice about applying for retirement benefits in the same month as your spouse if one or both of you are applying early.